Punta Arenas is mostly built on a sloping terrace dropping gently from the long line of hills behind. A large part of this terrace is actually an alluvial fan built up of sediment washed down one river from a valley cut into those hills. The hills are of soft unconsolidated sands and shales, but with occasional more interesting strata such as oyster shells, fossilized tree-trunks or, importantly, coal. Whilst the coal is not good quality and might be better classed as lignite or brown coal, it has been worth digging out from a number of sites over a period of 150 years or so. Because the valley's sides were the easiest way to gain access to the coal strata, the river within it became known as the 'río de las Minas'. 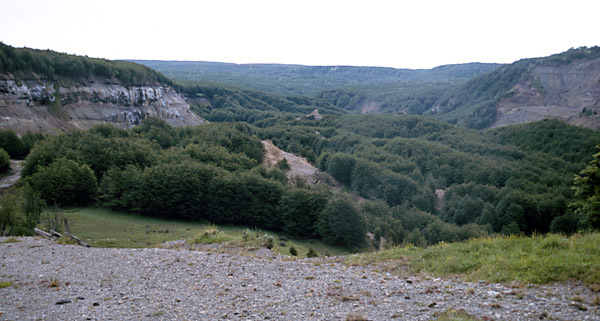 The photo was taken looking west into the upper reaches of the 'Valley of the River of the Mines'. The bare slopes show where the loose sediments have collapsed through slumping or mudflows. The whole area is now a National Forest Reserve. A 3 foot gauge tramway to help shift the coal to the town had been begun as early as 1869, first with horsepower though later with two locomotives of some kind (1). The engineers were José Clemente Castro, and the concessionaire initially a Senor Rojas but eventually the Sociedad Carbonifera de Magallanes of 1872. This early line only ran for 5-6 km and cannot have extended into the valley itself. It probably started somewhere near the town sawmill (in what is now Barrio Prat) and ran down roughly parallel to the river before winding through the streets to reach the seashore. A muelle was built and three 40 ton iron lighters purchased to ferry the coal out to waiting ships. However, the line seems to have suffered greatly from river erosion in flood times and may have been out of use and dismantled by the mid 1870s with the stock (though not the locos?) having been sold (2). However, a photo of the Plaza Muñoz Gamero taken in 1880/1 clearly shows track still in place. Interestingly, when the violent insurrection amongst soldiers and convicts occurred at Punta Arenas in 1877, the governor is reported to have hidden his family for safety in 'a small engine shed close to the sea' (3). Whether this was that belonging to this tramway has not been confirmed. An 1890s report stated that the rolling stock had been from Britain (4). This has recently been confirmed by Señor Mateo Martinic having unearthed the first known photo of either of the locomotives (19). Although a poor quality print it does enable its identification as Manning Wardle 0-4-0ST number 580 of 1876. This was supplied to the Straits of Magellan via Bates Stokes & Co., and is clearly labelled in MW files as being of 3' 6" gauge. The loco was a 'class H special' and had an unusual cab with porthole spectacles and a curved backsheet. It also had side buffers. 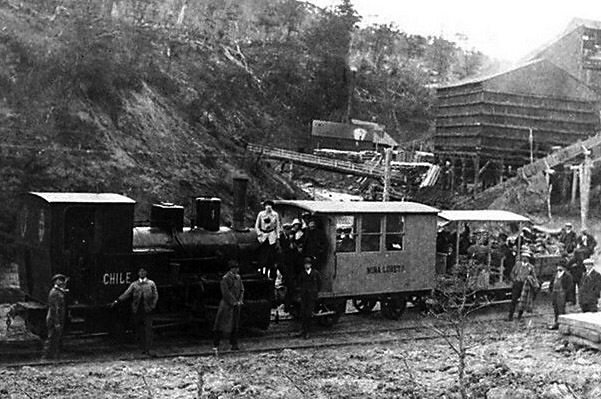 The photo recently discovered by Señor Mateo Martinic and published in his 2005 paper 'Ferrocarriles en la Zona Austral de Chile, 1869-1973'. The only other known picture of the early tramway is also of poor quality, however it does show a few wagons on one of the muelles. A three-masted barque is in the background. The photo dates from 1874. The mine which later became known as the Mina Loreto was a fairly substantial venture by this time as the 1874 photo below shows. It is recorded that 8,000 tons of coal was brought out in 1877. Whilst there is no sign of any railway in the above picture there were probably mine tubs used underground. The picture below, though taken later, shows a fairly primitive pair of wooden wagons on what looks like a rather narrower track than the one metre gauge of the eventual main railway. I believe such trucks eventually ran out from Mine 1 on the surface for a couple of hundred yards before reaching the big coal hopper over the later railway. The route through the town was eventually duplicated on a different course. A British Admiralty chart of 1883 shows both clearly (5). After running into the town along the south side of the river, one branch headed for the old muelle by way of the east side of town (later slightly adjusted to fit the new Avenida Colon) and Calle O'Higgins, The other branch took Calle Talca, Calle Valparaiso (now C. Walter Siguel), The Plaza, Calle Coquimbo (now Calle Errazuriz) to the new muelle. The 1883 chart clearly shows the two tramway routes. The 'mainline' comes from the northwest between the river and 'Lookout Hill', and then breaks into two. The one around the northeast side of town reaches the 'Old Pier', whilst the other twists and turns to follow the grid pattern of streets on its way to the 'New Pier'. It should be noted that 'Sandy Point' is the literal translation of Punta Arenas and this English version was in common use at the time. If you visit the tax free 'freeport' at the north side of the now greatly expanded town you will find one of the larger buildings making use of this old name and clearly labelled 'Sandy Point'. This early mining venture only lasted a few years and by the late 1870s the tramway had fallen into disuse. It was reported that the rails had been appropriated for use in one of the muelles. 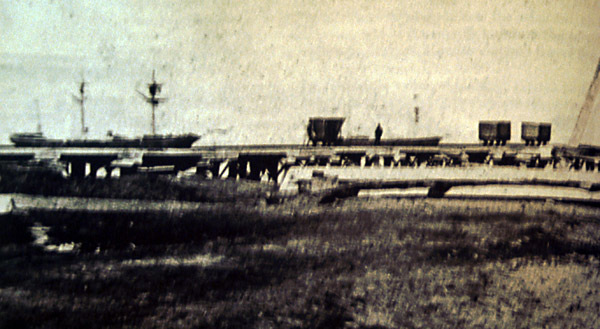 An American visitor, J. R. Spears in the 1890s, described the original muelle as being in disrepair and the line’s steam loco as being half-buried in sand (6). 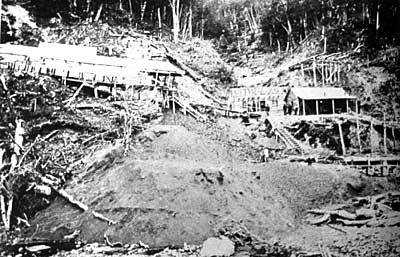 Another commentator writing in the Estadistica Minera de Chile in 1906, records that in 1889 or 1890 the two locos half-overturned lay out in the open air and that the railway track was entirely destroyed (7). The start of the twentieth century saw a fresh beginning for the tramway. The concession was bought from the original operators by Señor Agustin Ross who gave the mine the new title of Mina Loreto (8). 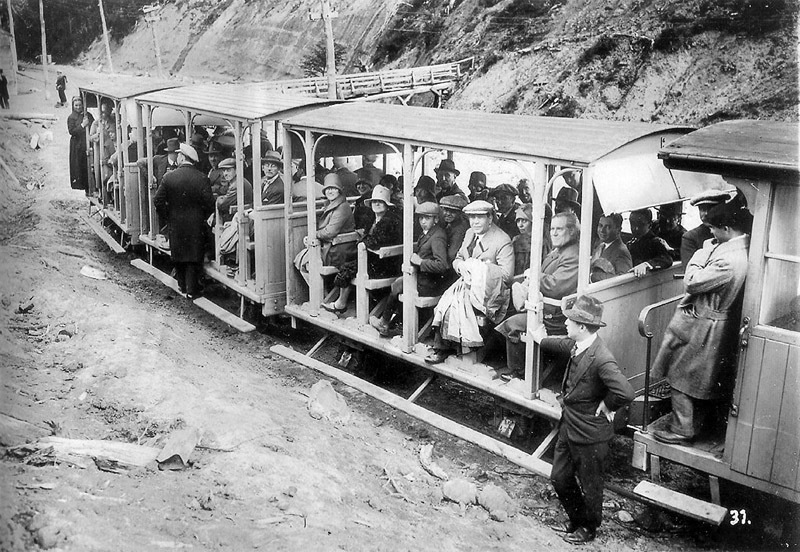 He reconstructed the tramway during 1897 onwards as a much more substantial metre gauge railway and extended it into the valley as far as the mine. The engineer on this occasion was James Armett. The total length was now about 8.5 km. The coal being somewhat friable a briquette-making plant was established alongside the railway in 1904. From some time in 1901 the railway was operating with new steam power. Its first appearance in Chilean national railway statistics that year (9) records that it had 1 loco, 1 coach, and 23 wagons. In its first full year of operation in 1902 it carried 980 passengers and 35,210 'quintales metricos' of freight (= 3,521 tonnes?). 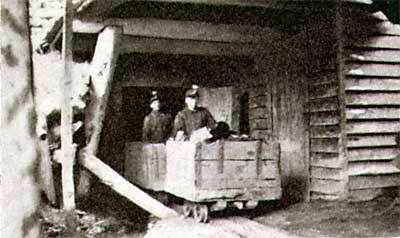 Mine production was up to 12,000 tons by 1906 but coal was not the only traffic. General cargo, drinking water, and also passengers were carried, with special excursions on Sundays. The loco shed and workshops were built near the sawmill, at about the mid-point of the line. There was also a short branch to the south before the mainline entered the valley, but its purpose is uncertain. "In the early hours of Saturday afternoon an alarming rumour circulated through the town that a very serious accident had happened on the Mina Loreto Railway, resulting in several deaths, besides injuries to other persons. Happily, the first news of this unfortunate accident proved to be somewhat exaggerated, and as a result of our enquiries into the matter we learned from a trustworthy source the true state of affairs. About 12.30 p.m. the train of the Mina Loreto was loading a quantity of timber near the mine, and as the weight of the trucks gradually increased above the normal, the whole train, owing to the sharp declivity of the line in this part, began to move. 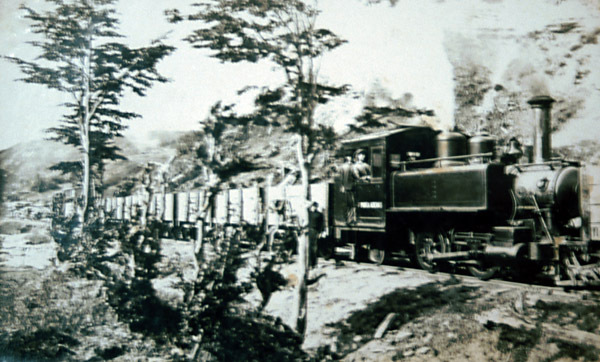 The engine-driver, a Spanish subject of the name of Hipólito San Román, although he tried by every means to check the onward rush of the train, was unable to do so, with the result that it dashed at full speed into another truck, which had been left behind on commencing the journey. As a result of this accident, the engine-driver died of his injuries a few minutes afterwards, and five other persons were taken to the Hospital, in a more or less serious condition, where they are receiving every attention. 13 (earlier sources consistently report the existence of only 3 stations, whilst from 1924 12 is the total). Local Pellin wood, 0.15 x 0.2 x 2m; 1150 per km. 25 per thousand/ 1 in 40; or 33 per thousand/ 1 in 30 according to US DEpt. of Commerce report. 3 (all under the line, across the river). Other sources suggests there were 4 totalling 61m in span. 4, of 18.5 tons weight in service (Estadistica); or 4 of Baldwin and Koppel make (US report) of 28,000 and 40,000lbs weight respectively. 44 (mainly flats and hoppers acc. to US report). There are a number of items of interest here. Coal traffic has increased to over 33,000 tonnes. The loco mileage, (allowing for light engine workings to the maestranza at the half way point) equates to about 700 round trips per year, or two round trips per day in a seven day week. This also suggests that the average downhill loading of coal was less than fifty tonnes per trip. The US report on the other hand states that there were four trips per day carrying 121 tons (each?). A study of the figures forwarded to the government each year is revealing. The railway's staffing seems to vary considerably – between 8 and 39, and even up to 96 in one exceptional year; perhaps someone misread the figures? There also seem to have been a number of minor accidents – 10 derailments for example in 1924 and in 1927, and one railway staff member killed in a derailment in 1922. In most years the railway seems to have made a modest profit though there were exceptional costs in 1916 and 1923 of an unknown nature. Coal production must have increased even further during the Second World War when good quality European coal was impossible to come by. In the Isla Riesco and Peninsula Brunswick area overall, production almost trebled by 1943. However, oil was increasingly taking away coal's markets and after the war the end came swiftly. 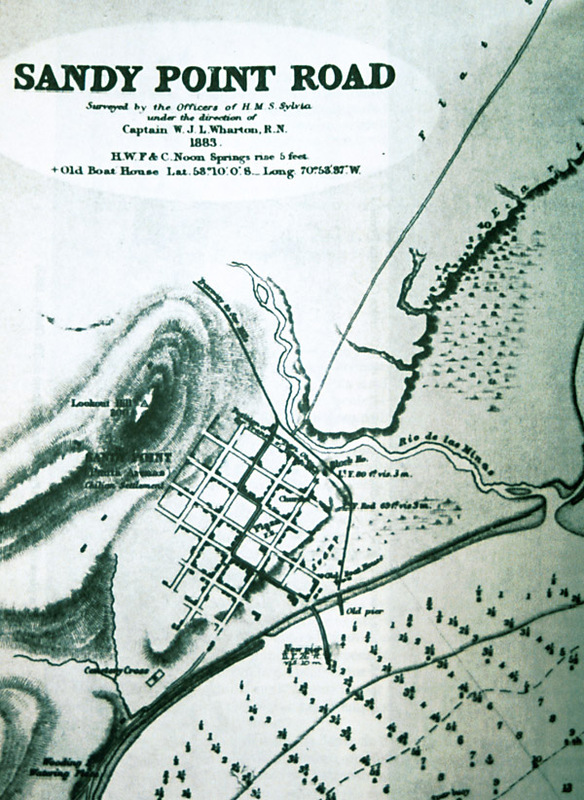 The railway was first cut short to the Talca/Colon junction and then right back to the maestranza. By 1950 both it and the mine had closed. The early tramway certainly had locomotives, as mentioned at the head of this page, but no details have survived. As mentioned in the caption the photo shown illustrates a Manning Wardle 0-4-0ST, probably of class D, E, or F.
The new 1902 railway purchased 0-4-2Ts from the Baldwin Locomotive Works. The first arrived in January 1902 just as the new track was completed. Some reports suggest that two were in operation later that year. On the other hand other reports from the early years state that the railway had one loco along with one coach and 23 wagons (12). The BLW erecting drawings catalogue of the DeGolyer Library lists the 1901 loco illustrated below as the line's no. 1, whilst a later 1906 loco is shown as line no. 2. 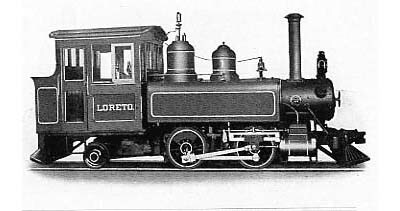 One of the line's first locos is shown here in a sketch from a later BLW catalogue. This was a small 0-4-2 side tank with 9 x 14 inch cylinders and weighing about 28,000lbs, of BLW's 6-11 1/3C class. This engine is clearly named 'Loreto' but if a second existed it has not yet been identified. One has been pinned down as class 6-11 1/3C no. 47, of 02/1901, - lignite fuel - metre gauge - Baldwin no. 18510, ordered by Agustin Ross (13). The railway eventually purchased two more Baldwins, but of a slightly larger size.These had 11 x 16 inch cylinders, 37 inch driving wheels, and were roughly of the 6-16 1/3C class, weighing about 44,000lbs. One of them, illustrated below, was delivered in 1917. The other arrived earlier, in 1906. 'Punta Arenas' was class 6-16 1/3C no. 59, of 12/1906 - lignite fuel - Baldwin no. 29719 for Agustin Ross. 'Magallanes' was class 6-16 1/3C no. 67, of 2/1917 - soft coal fuel - Baldwin no. 44824 - ordered via W. R. Grace & Co (13). A Baldwin builders' photo showing the 1917 built loco 'Magallanes' The worksplate on the smokebox bears the number 44824. The name is on the cabside. In comparison with the earlier locos, it can be seen that the boiler and tanks are higher and the chimney shorter and wider. It is interesting that an automatic coupler is fitted. 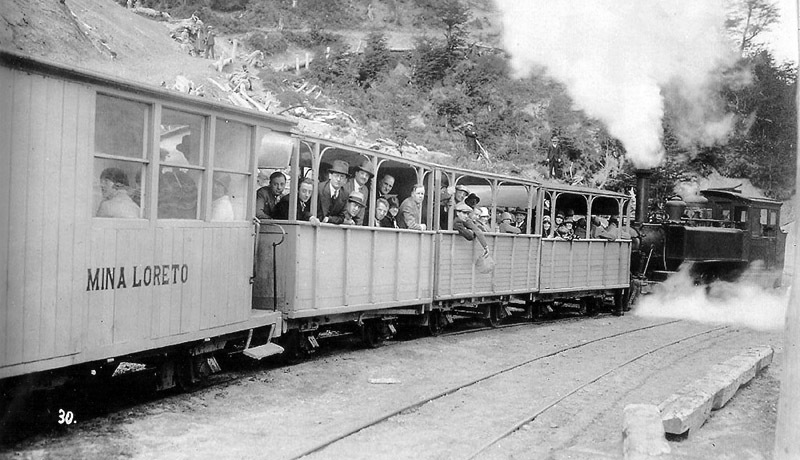 The picture shows the 1906 built 'Punta Arenas' on a train of open wagons in the valley. The loco is of typical Baldwin styling Strangely there seems to be a wagon ahead of the engine. The 1930 US Dept. of Domestic and Foreign Commerce report (14) states that there were a total of four locos but that they were of Baldwin and Koppel manufacture. For a long time we doubted that a German loco had worked at Mina Loreto but recently, in 2011, two photos have surfaced which prove beyond doubt that this was true (22). This locomotive appears to be a German built 0-4-0T bearing the name 'Chile' on its cabsides. It's identity has not yet been ascertained. The second photo seems to have been taken on the same occasion. These pictures also show various items of rolling stock clearly. 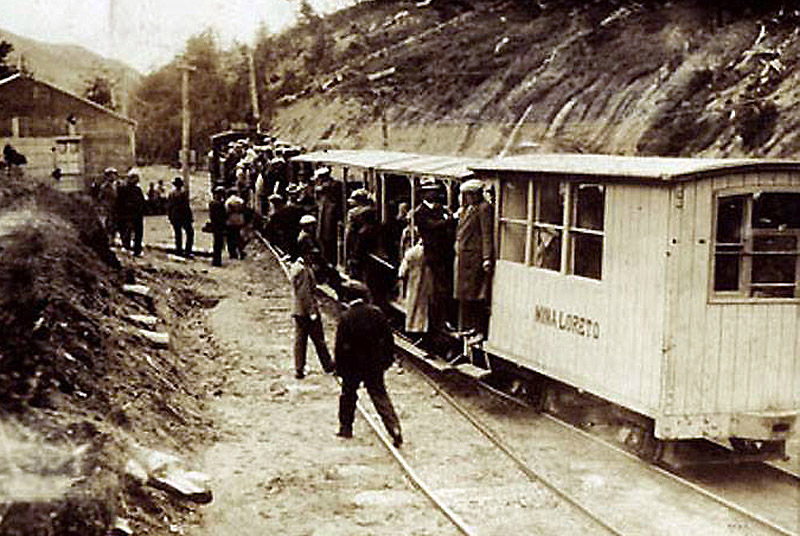 Whilst on the topic of German engines, in 1913 a small metre gauge Koppel 0-4-0WT was supplied to a customer in 'Patagonia' via the Argentinean office of agents Duncan Fox and Co. This loco was eventually resold to the Puerto Bories frigorifico line up in Última Esperanza. Whilst there is no evidence that it worked on the Mina Loreto line, this must be a possibility. It would however have been a good deal smaller than the measurements given above. Wilfred Simms (15) suggests that the 10hp O&K 0-4-0T preserved at the Escuela Industrial in Punta Arenas worked on the Mina Loreto line rather than at San Gregorio as is normally assumed. 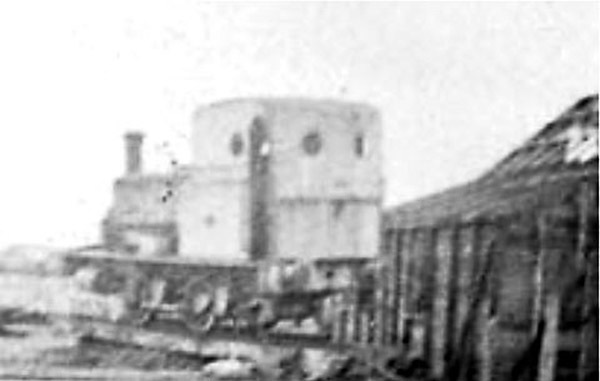 One source suggests that two British-built locos were purchased to help with the extra load during the war, but this seems unlikely and all known photos show merely the Baldwin and Koppel engines. The open wagons and the four coaches were all on two axles. Both high-sided and low sided wagons appear in photographs as do some very primitive looking coaches. The table of Estadistica data above lists 88 open wagons in total, of which 44 were in use in 1928. The US report confirms the total of 88. Allen Morrison suggests that the four open cross-bench passenger cars were bought in 1910 and that thereafter a regular passenger traffic built up, particularly for Sunday picnics up the river (16). Passenger traffic was up to 18, 784 for the year 1938 (17). The following views were taken on the occasion of the visit of the Cap Norte cruise liner in 1927. There are three toast-rack coaches in the train. It should be remembered that cruise liners disgorging hundreds of passengers to visit the sites is not a new phenomenon; it is something that took place in this area from the 1920s. A series of photos from the top of the line to its foot are on the next page. Mateo Martinic in his book Magallanes de Antaño (18), states that there were three proposals to build an electric street tramway in the town, in 1907, 1921 and 1922. Allen Morrison confirms these dates, though it is not clear whether either of them is quoting the other. None of these came to anything. However, details of the first of these proposals have been found in the Biblioteca Nacional in Santiago. This document is reproduced in an appendix. 1 Estadistica Minera de Chile – Tomo 3. 1906. Sociedad Nacional de Minera, Santiago. p373. 3 Article (in English) in The Review of the River Plate, May 26 1894, p30. 4 The Gold Diggings of Cape Horn. 1895. J. R. Spears. G. P Puttnam’s Sons, New York and London. 5 Admiralty chart No. 545 of 1884. 7 Estadistica Minera de Chile – Tomo 3. Op. cit. 8 New concession awarded16 December 1900. 9 Sinopsis Estadística i Jeografica de la Republica de Chile, Issues of 1901-2. Santiago. 10 Estadistica de los Ferrocarriles en Explotacion. Published annually by the Departamento de Ferrocarriles, Ministerio de Fomento, Santiago de Chile. 11 The Railways of South America - volume 3 Chile. Ed. W. Rodney Long. 1930 . U.S. Bureau of Foreign and Domestic Commerce, Trade Promotion Series no. 93. Washington DC. 12 Los Ferrocarriles de Chile. 3rd edition 1912, 4th edition 1916. Marín Vicuña, Santiago. 13 The dates and numbers of the locos were kindly provided by James Ira of the USA from his collection of Baldwin class books and index of builder's numbers. He notes that the De Golyer University Library collection of Baldwin drawings includes erecting drawings for the 1902 and 1917 locos, drawing nos. 465-39,& 471-8. 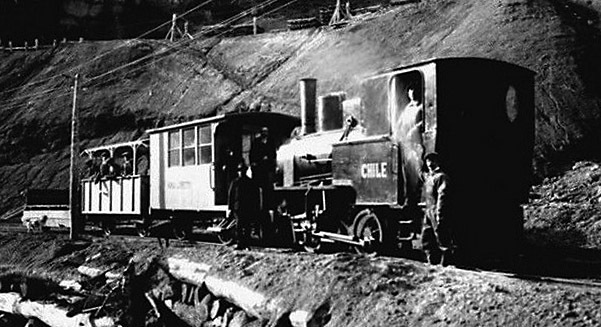 14 The Railways of South America - volume 3 Chile. Op. cit. 16 The Tramways of Chile, Allen Morrison, 1992, Bonde Press, New York. Text available online. 17 Nuestros Ferrocarriles. Huidobro Diaz, 1939 Santiago. Quoted in Allen Morrison, op. cit. 18 Magallanes de Antaño. 1985. Mateo Martinic B. Punta Arenas, publisher unknown. 19 Ferrocarriles en la Zona Austral de Chile, 1869-1973. 2005. Mateo Martinic B. Instituto de Historia, Pontificia Universidad Católica de Chile , Santiago. The text of this paper is available on the internet. 20 Advice on the provenance of this loco kindly provided by Mike Swift. 21 The Magellan Times, Punta Arenas, June 1916, by courtesy of Duncan Campbell's 'Patbrit' website.